Automatic syncing for an iPad mini is great; it selects items to sync based on criteria you’ve specified, such as genre, artist, playlist, and album. But it’s not efficient for transferring a few items — songs, movies, podcasts, or other files — to your iPad. The solution? Manual syncing. With automatic syncing, iTunes updates your iPad automatically to match your criteria. Changes to your iTunes Library since your last sync are synced automatically to your iPad. With manual syncing, you merely drag individual items to your iPad. Automatic and manual sync aren’t mutually exclusive. If you’ve set up automatic syncing, you can still sync individual items manually. You can manually sync music, movies, TV shows, podcasts, and iTunes U lessons but not photos and info such as contacts, calendars, and bookmarks. Connect your iPad to your computer via USB or Wi-Fi. If iTunes doesn’t open automatically, open it manually. Click the iPad button just below the Search field. Also, as mentioned previously, the button won’t say iPad if you have more than one iDevice. Instead, it will display the number of devices you have, such as 5 Devices. Click the button to display a list of your devices, and select the device you want. (Optional) Click the Summary tab and select Manually Manage Music and Videos in the Options section. This step disables automatic syncing for music and videos. If you’re happy with automatic syncing and just want to get some audio or video from your computer to your iPad, feel free to skip this step. Click the On This iPad tab. Click the Add To button (near the top-right corner of the iTunes window). A new pane appears on the right side of the iTunes window. 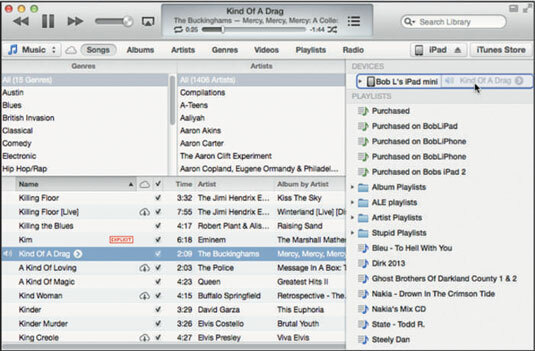 Drag your chosen media from the left side of the iTunes window to the pane on the right. In this example, The Beatles from the Artists tab was dragged , but don’t forget that you can drag media from all those other tabs — Songs, Albums, Genres, and so on. And you can add other types of content, such as movies, TV shows, podcasts, and books. Just choose a category from the Library pop-up menu. Click the little angle bracket in a circle (shown in the margin) next to any song, album, movie, TV show, book, or other media. Choose Add To from the pop-up menu. A list of possible destinations will appear; click your iPad in the list and the file will be added to your iPad. Click any eligible item (or items) in your iTunes Library and start dragging the item or items to the right. A pane with a list of connected devices appears on the right; drag the item to your iPad in the list. And that’s pretty much all you need to know to sync files automatically or manually, so you can view or listen to whatever you like on your iPad.